You are reading page 6 of Critical Thinking. If you want to start from the beginning Go to First Page. carolinapooh has 10 years experience. The first thing I learned in nursing school is that this term is basically a wax nose and isn't exactly used by nurses the same way it is in other disciplines (where it's much clearer in meaning). However it usually refers to knowledge application to a situation, and there is cross over with other disciplines in terms of analysis and judgement. Trying to get nurse educators to define it can prove to be interesting though--most I've asked have said some variation of "use your critical thinking to figure out critical thinking". Kind of like the first response--we won't tell you, you must figure it out. Quite helpful. I think what that does is create a user defined term, which explains the varigation. 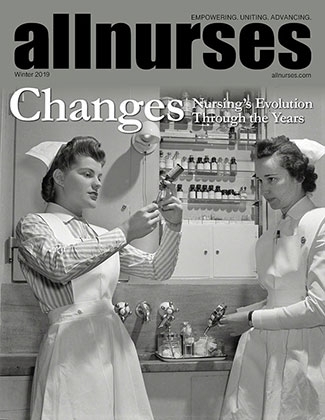 It gains contextual variation--that is, most nurses just guess at what it means based on the contexts it gets used in. It may be that nurses leave it undefined, in the same way health is often undefined by the public, so that it can take on those nuanced contextual meanings. Or more likely, most don't know the actual definition because it also functions in nursing as a strong in-group password. Either you get it or you don't and if I have to tell you you're not a good nurse. So it is left undefined even though the term does, in fact, have a straight forward meaning everywhere else. To be honest though I find it's most often used to say someone is stupid or doing something wrong: "she needs to use her critical thinking more" "where is your critical thinking" etc. It's also interesting that the specific language construction is unique to nurses (eg use critical thinking as opposed to think critically, as if it is a commodity rather than an action). I think this is telling in that to use it the way other disciplines do (ie think critically) reveals more clearly what the term is meant to convey. In nursing, it really is just in-group jargon. That said, it also points to the knowledge application function, the common one for nursing. I like your post, but I think the reason the whole definition thing is a problem is this: I see the nursing profession continually trying to claim ownership of itself, whether it's through nursing diagnoses (oh please - just speak medical like the rest of the hospital - I really cannot take that stuff seriously - we all know what lies within our scope of practice so just speak it in the same language everyone else is using) or trying like mad to stamp higher level thinking with the moniker of nursing. It's evaluation, synthesis, and analysis - and it's not owned, invented, or even unique to nursing. It's higher level thinking. It doesn't belong to us. It never did. It was around long before nurses were believed to be capable of such thinking (it was quantified by Bloom, an educator, in the 1950s as a guide for designing increasingly challenging learning objectives). Back when we were handmaidens that stood when a doctor entered a room. I hate buzzwords in general - I think they're ridiculous. No fancy word or catchphrase is needed to explain what this is. It's used EXACTLY the same way in every profession - it's synthesis, analysis, and evaluation. That's all we're doing. It's not any different than what anyone else does - just, like everyone else, we're just using it to determine different information. We use it the same way an engineer does, a doctor does, an architect does....we're just applying it to our own scenarios. The process is exactly the same. Those insane nursing dx? They're using synthesis, analysis, and evaluation. X r/t Y d/t Z...or however you word it, and the interventions that follow are using the applied taxonomy. There are different levels of it - new nurses scratch the surface where a more experienced nurse will go farther - which is where the honing of the skill comes in. It's the ability to "connect the dots." To know a piece of information and be able to infer possible consequences or outcomes. For example, if your patient is on enoxaparin and their platelet count is 64. #1, you need to know to check their platelet level before administration, #2, you need to know that giving it could potentially lower that level even further. #3, you need to know the risks associated with that. So, from one simple order for enoxaparin, you go thru a series of steps in your brain (or critically think) to determine whether you should administer it or not and why. Excellent explanation with a clear example. canigraduate works as a RN. Oh, good grief. 5 pages and nobody bothered to look it up? Why should we? We're not the one(s) wondering what it is. The simple definition that always comes to my mind is thinking about your thinking with the goal of improving it. Learning to weigh various options using logical, disciplined and systematic processes. that usually there will be diagnostics requiring the patient to be NPO. It is a combination of all these things, but you have to know a thing or two in order to have something to pull from as you think. Because everyone is giving their personal opinion on what it means. It's a term with a definition. I mean, a spoon is an eating implement to me, but to a baby boy it is a wall-decorator, paintbrush, or drumstick. He doesn't know what a spoon is. If I didn't know what a spoon is, I would appreciate it if someone would tell me. I think I like joanna73's the best, though. Clear and to the point.